Easily and safely customize your Mac OS X login screen. Is there a better alternative to Visage Login? Is Visage Login really the best app in System category? Will Visage Login work good on macOS 10.13.4? 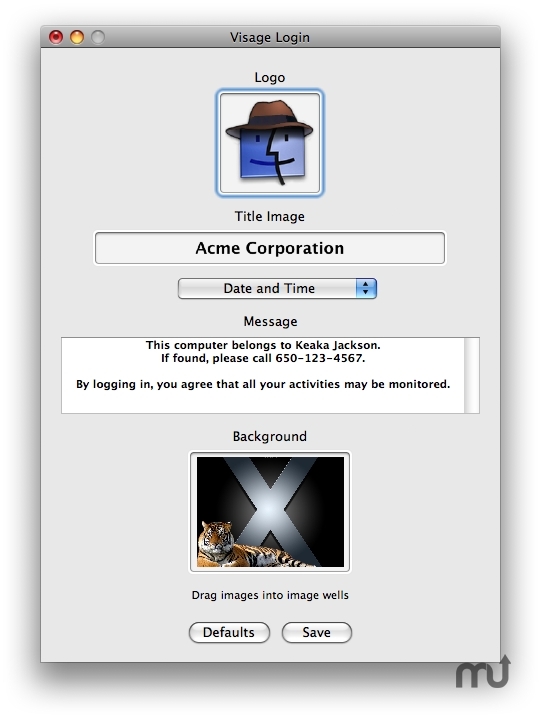 Change the login panel images, including the Apple logo, Mac OS X image, and background image. Add a custom text banner to the login window. This is ideal for organizations that need to show the user information or an Acceptable Use Policy prior to login. Tested with Mac OS 10.6 Snow Leopard. No longer shows Mac OS 10.6 users a warning that Mac OS 10.4 or 10.5 is needed. Fixed issue that prevented a small number of users from setting the login screen background image. Visage Login needs a review. Be the first to review this app and get the discussion started! Change the host information displayed by default. The host information can display the current date and time, Directory Services status (network accounts), IP address, system version, host name, serial number, and more. Visage Login is a simplified version of the Visage System Preferences pane. The Visage preference pane offers even more ways to customize Mac OS X. If you like to personalize your Mac, Visage is an essential tool! Added ability to change the host information displayed by default. The host information can display the current date and time, Directory Services status (network accounts), IP address, system version, host name, serial number, and more.